NKD Nutrition Naked Casein is a great choice if you’re looking to tap into the benefits of casein protein. This protein powder has 26 grams per serving, which is an awesome amount for those looking to build, maintain, and repair lean muscle. The main source of protein is 100% premium micellar casein. This is a very high quality protein that isn’t denatured during processing like calcium caseinate is. Micellar casein is slow digesting and clots in the stomach, which allows for a slow and steady flow of amino acids (versus whey where the process happens A LOT quicker). This is incredibly beneficial for muscle growth and repair, especially when taken right before bed. It also has 5.4 grams of branched chain amino acids (BCAAs) per serving, which may also help build and repair muscles after working out. This protein is cold pressed so it doesn’t use any chemical detergents (no acid or bleach), synthetic additives, or heavy metals. It’s also very clean and pure, since micellar casein is literally the only ingredient in this protein powder. It’s free of gluten, soy, GMOs, artificial colors, flavors, or sweeteners. It does contain milk though, since the only ingredient is casein. However, they use skim milk that’s not treated with any growth hormones such as rGBH or rBST. Also, this product only comes from US farms and not anywhere else. A few other perks of Naked Casein are that it’s low in calories and free of fat, carbs, and sugar. 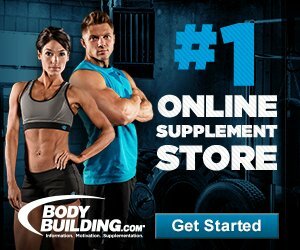 This makes it a great option for clean muscle growth and for those following a clean diet in general. Not only can this powder be used in shakes and smoothies, but you can also bake with it. I really like how straight forward and pure this product is. You get straight casein protein without any added junk. So overall, we gave NKD Nutrition Naked Casein 4.5 out of 5 stars, which makes it an above average protein powder. NKD Nutrition Naked Casein mixes incredibly quick and easy. Just take 2 scoops of the powder and mix with 6-10oz of water or your favorite beverage. Mix in a shaker bottle or blender for 20-30 seconds for a super nice, thick shake. In a pinch, you could even mix with a spoon. The powder is very fine and prevents it from having any chunks. As you’d imagine, it doesn’t have much flavor to it. The best way I can describe it is like unsweetened milk. It’s basically plain and isn’t sweet at all. This can be good or bad depending on your personal preference. When I just mixed it with water, it wasn’t too bad. You can amp up the taste by mixing it with milk or dairy free alternatives like almond or coconut milk. But this is a great option for those of you who don’t like downing super sweet protein powders. As for the macros, each serving (2 scoops) contains 26 grams of protein, 0 grams of fat, and 0 grams of carbs. This is a great amount of protein for those wanting to build, maintain, and repair lean muscle mass. The calorie content is 110 calories per serving. Since Naked Casein is fat free, has zero carbs, no sugar, and is low in calories, it makes for a great option if you’re eating clean. Overall, this is a great macro combination if you’re looking to gain some lean muscle mass. The sole protein source (and one and only ingredient) in NKD Nutrition Naked Casein is 100% micellar casein. Micellar casein is a very high quality and effective protein. It’s also superior to calcium caseinate because it isn’t denatured during processing. Naked Casein is free of growth hormones and uses skim milk that’s not treated with rGBH or rBST. It’s also cold processed and isn’t treated with acid or bleach. Micellar casein works by clotting in the stomach, followed by a slow release of amino acids into the body. This makes it a great option to take right before bed. There are 5.4 grams of branched chain amino acids (BCAAs) per serving, which may help build and repair muscles after working out. This protein powder is free of anything artificial or any additives. There are no artificial colors, flavors, or sweeteners. It’s also FREE of soy, gluten, and GMOs. Since it’s made from casein, it does contain milk. I didn’t experience any negative side effects when taking Naked Casein. It has 26 grams of protein per serving, which is a solid amount to help build muscle. This particular product is ideal to take right before bed. Casein is a slow digesting protein and provides a slow and steady flow of amino acids to help your muscles recover and grow. 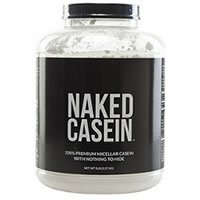 NKD Nutrition Naked Casein costs $94.99 for a 5lb container. That works out to about 4.80 cents per gram of protein. Up front, almost $95 for a protein is definitely steep, but when you break it down it actually ends up being cheaper than your average protein powder. Not to mention the 5lbs offers up 76 servings, which will keep you and your muscles happy for quite some time. I wasn’t able to find any sort of satisfaction or money back guarantee on NKD’s website. That’s a little disappointing since this protein powder is just shy of $95.00. However, if you buy the protein from other retailers such as Amazon, you might be able to get a refund. To buy NKD Nutrition Naked Casein, click here.